Today there are many subdivisions and areas which don’t allow conventional fencing. If you own a dog in one of these areas you may want to consider an invisible fence for dogs. Invisible fence manufacturers claim a high success rate when it comes to keeping pets inside their boundaries. A conventional fence isn’t necessary when an invisible dog fence is used. And, after installation and training, most pets do learn to respect the invisible fence. How does an invisible fence for dogs work? An invisible fence for dogs is often professionally installed, but do-it-yourself installations are also very common. Invisible fences can be customized to fit along the boundaries of virtually any property. A cable is installed underground along the boundaries of the property. A transmitter emits a signal that will be picked up by a receiver on your dog’s collar when he gets too close to the boundary. First, a warning sound will be given. If your dog heeds the warning and moves away from the boundary, the sound stops. Nothing else happens. If your dog ignores the warning and approaches the boundary he will get a small shock like static electricity. An invisible fence for dogs requires some training for pets before they become fully operational. 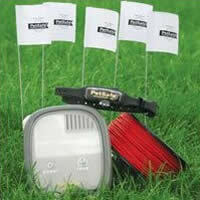 When these systems are first installed, small flags are placed along the property line. During the first week, the dog is kept leashed as he learns the boundaries of the containment system. He wears the invisible fence dog collar but one of the prongs on the collar which gives the shock is taped. This allows your dog to hear the warning sound when he goes near the boundary but he is not shocked. Instead, you can teach him about the invisible fence boundaries by giving him small corrective jerks when the warning sounds. Once the warning sounds and he learns that he’s not supposed to go closer to the boundary, you can take him back into the yard to play. After a few days of this training, the tape is removed from the prong on the collar and the dog is allowed to feel the shock when he approaches too close to the boundary. Afterwards, the dog should be allowed to go back into the yard to play as usual. As soon as the dog has the idea that going too close to the boundary causes a leash correction to occur, you can start adding some distractions to his training, such as a jogger running down the street, or a dog outside the perimeter of the boundary. Your dog should learn to ignore these distractions and return to playing in the yard. According to the invisible dog fence manufacturers, this phase of the training takes about a week. During the next phase of training your dog should have supervised off-leash training so that he learns the corrections occur because he approaches too close to the boundary and not from leash corrections. You can gradually start removing the flags from the yard at this point since your dog will know where the boundaries are. There are pros and cons to an invisible fence for dogs. On the positive side, invisible fence manufacturers say that some 99 percent of pets are contained by their fence systems. If you live in a subdivision which doesn’t allow chainlink or other kinds of fences, an invisible fence may be your only option. An invisible fence for dogs is humane and most dogs learn very quickly where the boundaries are and do not continue to test them. On the negative side, an invisible fence for dogs does not keep strangers off your property, and other dogs and animals can freely enter your pet’s yard and bother him. Anyone may walk into your dog’s yard and have no idea that there is a dog present — a dog who may not like having someone in his yard. Some dogs do ignore the shock corrections and leave the property. 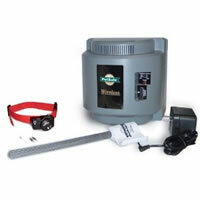 If your dog does leave the property he will receive a shock when he tries to return to his yard. If the owner doesn’t do proper maintenance on the system, it won’t work. If the batteries die or the collar doesn’t fit, or your dog needs to be groomed and the hair is keeping the collar from touching your dog’s neck correctly, the system won’t work. An invisible fence for dogs may be the perfect solution for some people and their pets. On the other hand, it may not work well for other people. As with most pet solutions you should weigh your options and consider whether this system would work for you and your dog.